I think I need an intervention. This food thing? This continual desire to create, prepare, and taste as many delicious things to eat as humanly possible? It’s gotten out of hand. Not only do I read everything I can about food and cooking (hello, subscriptions to Saveur, Cooking Light, Bon Appetit, Food and Wine, and Cook’s Illustrated, plus my ever-growing supply of cookbooks? ), coerce my husband into watching shows such as Hell’s Kitchen and Top Chef (he won’t watch No Reservations or Bizarre Foods with me), continually sign myself up for near-impossible tasks (let’s see how many different meats I can barbeque in 24 hours! ), and talk to family, friends, and you, non-stop, about this food or that recipe. Nope, that’s not enough. Now, this food thing has entered my dreams. No, I don’t mean daydreams, I mean wake-up-in-the-middle-of-the-night, OMG-this-is-a-genius-recipe-I-must-make-it dreams. I woke up one night, dreaming that I was feeding my husband and myself celeriac (celery root) soup, garnished with popcorn. I think it must have been a strange combination of various recipes I’d read lately, jumbling themselves around in my head, that caused me to dream of this. I immediately woke up thinking that I. Must. Make. This. Funny, since I’d never eaten celeriac in my life. But somehow, I just knew. This was the epiphany; this was the recipe. So a week or so ago (remember I told you how I’m behind on posting my recipes?) I set out to make this soup. I did grab inspiration from Rasa Malaysia (one of my favorite blogs) and her curry popcorn recipe, thinking that the blend of the curry and celeriac would be an intriguing flavor. And even with this idea being one that’s truly “out there” for me – it worked. Not only did it work, but the combination of a creamy, celery-scented soup, and a punchy, bold, crispy popcorn? Addictive! I would stir some popcorn into my soup, top with more, making sure each bite was a balanced soup+popcorn mix. I had a huge bowl that night. (my husband, despite my dream of serving it to him, wasn’t a celeriac fan, it turns out. He didn’t mind the flavor of the popcorn, though!) And lest you think this was a brief love affair that would quickly fizzle, I found myself loving this combo again for lunch the next day, and was sad when it was gone. 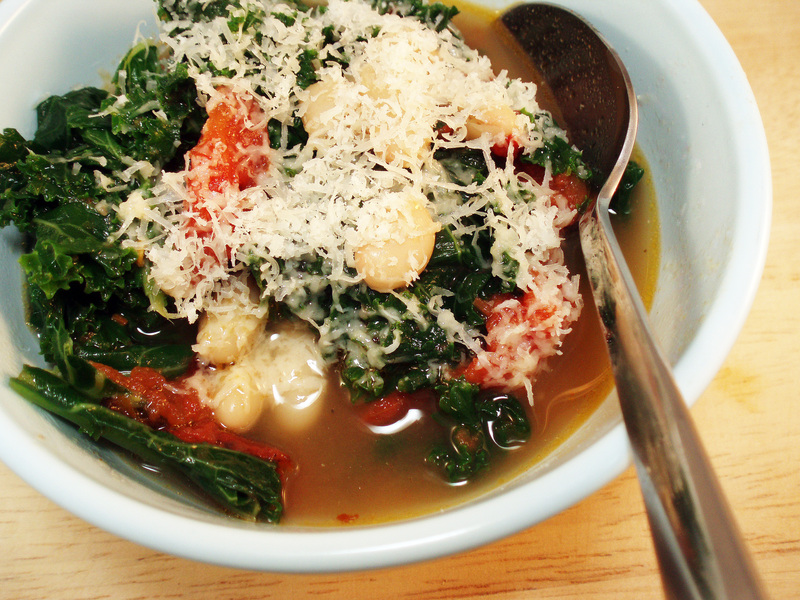 This soup makes for a lovely vegetarian dish – and is relatively easy to prepare. (It can even be made vegan if you opt to substitute olive oil for the butter, and hemp milk for the cream.) 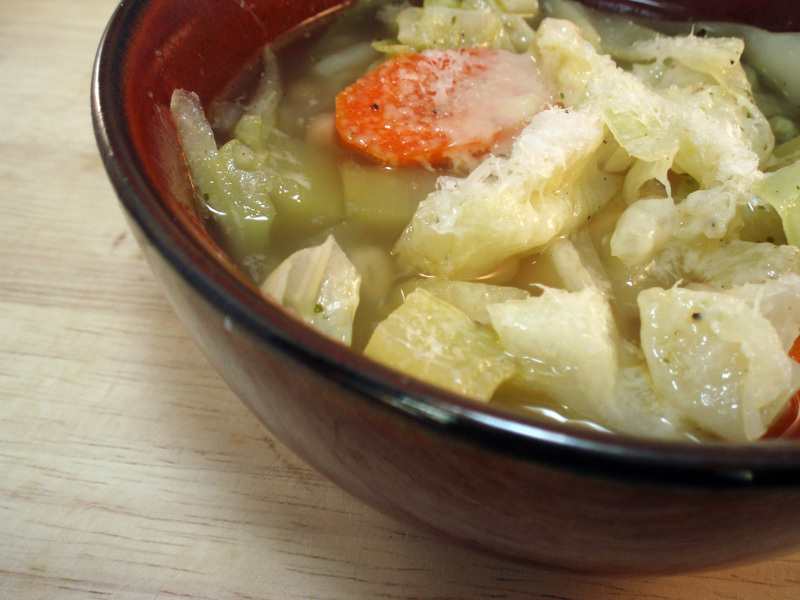 And of course, with the weather turning colder, a comforting soup may be desperately needed! So, do I need an intervention? Am I the only one that wakes up from dreams about recipes? Please tell me I’m not alone on this one! In a heavy, deep pot, melt the butter over medium heat. Add the celeriac, potato, garlic, leek, and onion. Cook until vegetables soften, stirring occasionally. Add the vegetable stock and bring to a boil. Reduce to a simmer, and allow to cook for 20 minutes or until celeriac is tender. Using an immersion blender, puree until smooth. (if no immersion blender, allow to cool for a few minutes and puree in a blender, in batches, if necessary) Return to heat, and bring to a simmer again. Season with salt and pepper to taste, and whisk in the cream. Top with popcorn just before serving, or alternatively, allow diners to top soup themselves. In a small skillet, toast the cumin seeds over medium heat until aromatic, about 30 seconds. Remove and crush the seeds with a mortar and pestle. Set aside. In a small saucepan, melt the butter over low heat. Add the curry powder and stir with a heat-proof rubber spatula (I used a wooden spoon – be careful, as it might turn yellow permanently!). Bring to a simmer, and set aside. In a medium saucepan over medium heat, add the oil and popcorn. Swirl to evenly coat the popcorn. Cover the pan, leaving the lid slightly ajar to allow steam to escape. Once the popping begins, hold the cover in place and shake the pan by moving it back and forth across the burner. When the popping subsides, remove the pan from heat and let rest with the lid still on for a few seconds. One more thing – I have been showered with awards lately! I can’t keep up! In the past week, I have received 4 Kreativ Blogger awards from 4 terrific bloggers – The Chickenless Chick, Experimental Culinary Pursuits, Vegetable Matter, and Tasty Trix all graced me with this award. If you haven’t had the pleasure of checking out these blogs, please do! I’m supposed to share 7 interesting things you don’t know about me. (I’m wondering at what point, once I’ve done this a few times, have I satisfied this for all awards? Not that I’m not grateful, I am, it’s just becoming harder to come up with things!) Anyway, here goes! 1. I was in choir when I was in middle and high school. Show choir, even. (Yup, choreography, costumes, and a pasted smile on my face while I’m singing – all of that fun stuff!) There was a time in my life where I honestly thought that I could somehow sing for a living. Looking back, I’m glad I don’t. I love music, but I don’t think I’d like being in the limelight all the time. 2. I like going grocery shopping. I’m sure I’m not the only foodie out there that shares this characteristic. I actually enjoy it – especially if it’s at a grocery where there’s cool and interesting stuff to be found, such as the ethnic groceries, farmer’s markets, or gourmet/specialty shops. 3. When I was a child, I loved to read. I couldn’t read enough. One of my favorite sets of books to read were these Time/Life science books – there was a book about the human body, a book about astronomy, a book about light (about about 20 others). They were really cool. What’s wonderful to me is that my parents gave this set of books to me a few years ago, and now I can share them with our kids. 5. I love watching Mythbusters. I think that they have some of the coolest jobs in the world. I mean, honestly, how many people get paid to blow stuff up in the name of science? 6. I am generally not a picky eater, but I cannot stand chocolate-glazed donuts or eclairs. (This precedes my going gluten-free, but I’m sure I wouldn’t want to eat gluten-free versions either!) I imagine that not many people share this dislike. But seriously, I cannot force myself to take a bite of one of these donuts. No matter how amazing you tell me it is. 7. I love the rain. Mind you, lately it has been testing my patience (we’ve had about 10 inches in the past month), as the floods cause so many issues, but if I’m sitting inside, or on the porch, I love to watch it rain. I even love the big thunderstorms. Now I’m to share this award with seven bloggers! 1. Cindy at Jacob’s Reward, because her blog is always a joy to read and she makes me laugh. 2. Terry at Blue Kitchen, because everything posted is drool-worthy. 3. Ellen at I Am Gluten Free, because her baked goods are awesome, I’ve made her gluten-free cinnamon rolls. Yum. 4. Erin at $5 Dinners, because who doesn’t love budget-friendly cooking that also tastes good? 5. Carrie at Ginger Lemon Girl, who cooks not only gluten-free, but also soy and dairy-free, and often vegan, but still makes it look amazing! 6. Kelly at Evil Shenanigans, because she’s a fellow Dallas-ite that always posts the most evil, sinful, decadent recipes! 7. Katrina from Gluten Free Gidget, because her blog is a delight to read – she is up-front and it’s like you’re right there with her. Thanks to everyone again, I’m honored! A few weeks back, I picked up this lovely pumpkin from Good Earth Organic Farm’s booth at the farmer’s market. I was told it was called a Cinderella Pumpkin. It was a lovely gourd, and it graced my kitchen for a while, bringing autumn charm into the house. However, it was time to do something more with my pumpkin. Since it was not a pie pumpkin, I thought a pumpkin soup would be lovely, especially if it were graced with coconut milk (one of my favorite ingredients). I started to browse around for ideas on how to elevate my pumpkin and coconut milk soup, and came across Heidi’s simple recipe at 101 Cookbooks. I took cues from her recipe, and made this soup my own, adding a few spices and loosely measuring. 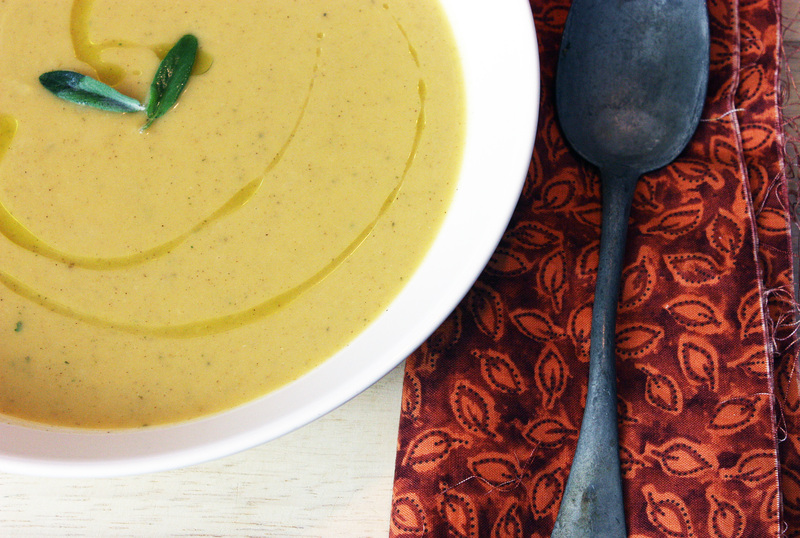 What resulted was a lovely creamy, warming, flavorful soup – filling enough to be a main course (we did just that! ), and wonderful when it’s dreary and/or cold outside. What’s even better? While this is not a super-fast recipe (although you could make it so, with canned pumpkin), it’s really easy, there is not a lot of time actively cooking, and it’s really hard to mess up. It also reheats beautifully for lunch the next day. And last week, I spotted a wonderful biscuit recipe over at Simply Sugar and Gluten-Free. I thought these biscuits would be a wonderful accompaniment to soup, so I threw together a batch. I changed up the recipe some, only because I wanted to use what gluten-free flours I had on hand, and I wanted to use only chives in the biscuits. But wow – just, wow! Amy sure does know her way around a biscuit! These were simply the best biscuits that ever have graced my kitchen, gluten-free or otherwise. I ate well more than my fair share of them. They will definitely be making another appearance soon! And lastly, before I share the recipes, I am excited to share with you that I have received 2 Blog Awards, given to me by two wonderful fellow food bloggers! Simply Life awarded me the One Lovely Blog Award, and Diana at Spain in Iowa gave me a Tasty Award! What can I say about these two wonderful bloggers? Thank you both so much! If you haven’t checked out these two blogs, take a moment and do so! Simply Life has a wonderful collection of tasty recipes, ranging from the fancy smoked salmon and pear on baquettes, to a lot of wondeful, family-friendly comfort food such as sweet potato risotto. Spain in Iowa has a wonderful collection of Spanish and Latin recipes, such as this pimientos asados recipe, to recipes using local ingredients, such as methods for preserving peaches. (She’s been preserving a lot of this summer’s bounty, check it out!) Thank you both for sharing these awards with me. 1. I have two dogs, Rocky and Jack. They are both Chihuahua mixes, and look like they could be brothers. However, they aren’t – Rocky is mixed with Manchester terrier (we think) and we adopted him in 2003. Jack is mixed with who-knows-what (we’ve considered a Corgi), and we adopted him in 2007. We adopted both of them at Operation Kindness, North Texas’ oldest and largest no-kill animal shelter. If you are local, and considering adopting a dog or cat, check them out. They’re located in Carrollton. (Not to get on a soapbox, but I’m a big proponent of adopting rescue animals. I personally choose to rescue an animal that might otherwise be euthanized, and give them a second chance at life, and do my part to keep the over-population of unwanted pets down. That’s all, I won’t get into this topic here!) Rocky and Jack are wonderful friends, and are always happy when I’m in the kitchen, waiting for a treat! They’re especially fond of carrots. 2. I play indoor soccer. I’m by no means an accomplished player (I started playing at the age of 22), but it’s great fun, and I am always learning. I love my teammates – everyone encourages one another, and it’s a great way to relax and stay in shape. 3. I cannot stand chocolate-covered donuts. (this precedes going gluten-free) I am generally not a picky eater by any means, but the thought of eating a chocolate-covered donut, or an eclair, makes me gag. 7. I like Velveeta. I know, I know, it’s practically not even real food. It’s artificially dyed and flavored. It’s horrible for you. I can only imagine that it likely does something awful to your insides, like if you eat too much, when you die, it will still be there, thousands of years later…but it seems that especially in Texas, you just can’t make queso without it. Velveeta+Rotel=YUM! Good thing I only eat it like once or twice a year. And, to share this award, I’ll pass it along to ten bloggers that I truly admire and appreciate! 1. Amy at Simply Sugar and Gluten-Free – she is always SO willing to give me feedback on my posts, is available to answer questions, and besides, she has WONDERFUL recipes on her blog! 2. Amanda at Amanda’s Cookin’ – she really goes above and beyond to enhance the blogger community. She’s created a Yahoo Group for food bloggers, which has been an endless source of valuable information! She posts so many gorgeous baked goods and desserts as well! 3. The folks at Food o’ del Mundo – Wonderful dishes, and always so inspiring! Not to mention, recently they went out of their way to help me out on posting to Foodbuzz, so I could be sure I get optimum results. What a friend! 4. Diane at The W.H.O.L.E. Gang – Awesome, inexpensive, gluten-free, healthy living meals! She continually comes up with great, simple ideas to feed a family, even with dietary restrictions. 5. Katie at Eat This. – Katie and I both went gluten-free (for similar reasons) at about the same time, so together we’ve come to understand what lovely and amazing gluten-free food options are available to us. She is definitely a wonderful resource for alternative grains, and sings the praises of millet, teff, and quinoa! She always has healthy and delicious recipes available on her blog. 6. Paula at Bell’alimento – What a lovely blog! She has delicious recipes, and she’s always available and willing to help someone out, even if it means “Stumbling” their blog that day! 7. Cindy at Jacob’s Reward – Cindy is an awesome blogger, even though it’s not a “food” blog. She diligently blogs nearly every day about the goings on at the Jacob’s Reward farm, is always friendly and available to help, and she’s more dedicated to her CSA and that farm than anyone I’ve ever seen! That, and her chickens give our family the BEST eggs…I’ve learned so much from her! 8. Jenn at Bread + Butter – Jenn’s recipes ALWAYS look drool-worthy. A few days ago, she posted about grilled cheese, which makes me nostalgic! She’s also a huge supporter of Tasty Eats At Home. 9. Marilyn at Just Making Noise – Marilyn’s recipes look so good, and they’re always healthy, with natural ingredients. She supports local produce and farmers as much as she can, which is pretty awesome, in my book! 10. Natalie at Natalie’s Killer Cuisine – Natalie makes decadent dishes, most of which cause me to gain weight just thinking about them! But seriously, her recipes are delicious, and she shows tremendous talent. Thank you again to Simply Life and Spain in Iowa, I’m honored! And now, to the recipes! Preheat oven to 375 degrees. Lightly season pumpkin halves with salt and pepper, and brush with butter. (can use olive oil if you prefer) Place skin-side down on a baking sheet, and allow to roast until tender, about 45 minutes to an hour. Remove and allow to cool. In a large stock pot, bring olive oil to medium heat and add garlic, ginger, curry paste, and coriander. Allow to cook for a minute or two, stirring, just until it becomes fragrant. Add pumpkin and coconut milk and stir, and bring to a simmer. Once simmering, remove from heat, and puree. (I used a hand blender, but if you don’t have one, you can blend in batches with your blender or food processor.) Place back on heat and stir in broth, a little at a time, until the soup is at the desired consistency. Taste, and add salt and pepper as necessary. Keep at a simmer for 5 minutes to allow flavors to meld. Garnish with minced chives. Serves 5-6. Preheat oven to 4oo degrees. Line a baking tray with parchment paper. Sift together flour blend and baking powder. Stir in salt to mix. Add cold butter, and either using a stand mixer on low, or even using a spoon or your hands, mix until the butter is the size of peas. Add milk and beat until just mixed together. Add chives and mix until just combined. Drop dough in large spoonfuls onto parchment paper. Brush tops with egg wash, and sprinkle lightly with kosher salt, if desired. Bake for 18-20 minutes, or until browned and puffy. Makes 8 biscuits.